In his two decade career, Fon Davis has worked on over 30 feature films. As a alumnus of the Industrial Light and Magic Model Shop, Fon has worked on features such as Star Wars, Pearl Harbor, Starship Troopers, Galaxy Quest, Terminator III, Mission Impossible III and the Matrix series. In addition to his work in visual effects, Fon has also worked in Disney's art departments as a concept designer/model maker, and on several stop motion projects including The Nightmare Before Christmas and Coraline. More recently, Fon worked on Interstellar, Guardians of the Galaxy and Neill Blomkamp's Elysium. 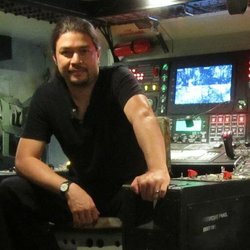 Fon is a creative director at Fonco, a celebrity judge on ABC's Battlebots, instructor at the Stan Winston School, a guest host on several nerd related shows and creates and develops his own projects, frequently using his broad knowledge in entertainment and visual story telling. With his vast experience, Fon is well-placed to discuss the art and craft of model making for cinema, from concept design to hybrid practical and CG VFX, with a particular expertise in knowing where models and miniatures can play a role in today's digital world.